Monte Verde Vineyards is small family-run winery in Santa Clara Valley. Winemakers Todd and Alexia Johnson started with 300 Merlot vines planted in 2000; growing to a hobby in 2003; and on to a passion in 2006 as they continued planting over 1300 vines, adding Cabernet Sauvignon and Tempranillo; and culminating as a award-winning winery in 2008. The first release was only a little over a year ago and they only produce 300 cases per year. Yet, they already are winning awards for their wines. Not too bad for a backyard (albeit big backyard) operation! As you can expect for a winery this size, every wine is truly hand-crafted. The grapes are specially selected and fermented in small lots based on vineyard designation. While caring for their three children, Alexia is also the primary winemaker, producing the wines with the care necessary to preserve the unique character of their vineyard. Only French oak is use, producing wines with balance and great quality. Todd continues in his day job and cares for the vines in this organic dry-farmed vineyard. The area features excellent climate for their wines. Backed up by the Santa Cruz Mountains, they have the typical hot Morgan Hill days, but the mountains provide the cool nighttime temperatures to allow the vines to rest. 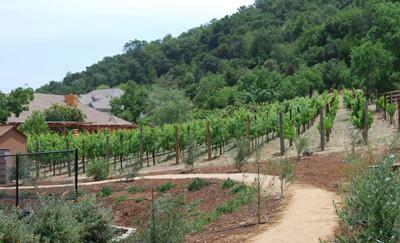 They have recently completed a new winery building with a tasting room for special events. The primary tasting room continues to be an outdoor affair opened every third Saturday of the month. Here you will not only have a chance to meet the Johnson family, but also the friends who are an important asset to this family winery.